Our latest video takes a look at the current real estate slump in Toronto, which was triggered by the Ontario government’s decision to add a Foreign Buyer Speculation Tax in April, 2017. We compare the Toronto experience to that of Vancouver, which also endured a slump when their foreign buyer tax was added in 2016. Hello everybody, welcome back. It’s Randy Selzer here. Thank you for returning to my YouTube Channel. Today we’re going to talk a little bit about the Toronto real estate market and what has been going on over the last few months. Stay tuned and we’re going to talk about all sorts of good stuff. Fortunately, we can look at Vancouver because Vancouver went through a very similar thing that Toronto’s going through right now. Vancouver brought in a foreign buyer tax last year, actually, it took effect on August the second of 2016. They also had an immediate drop in the market there. Sales went way down at one point, at the end of last year actually sales activity had dropped 57% year over year, and prices had sagged as well. One of the interesting things in Vancouver, they have since recovered. The drop that they went through was pretty severe, especially for detached houses, condos actually fared fairly well. It took a fairly large drop and then it’s picked up again. The total time that Vancouver was down in prices was about eight months from the beginning to the end of the trough, and then it picked up again early this year. Now, believe it or not, the prices in Vancouver are back to where they were a year ago and in fact are even higher. We look at detached houses in Vancouver year over year right now, July, the end of July 2017 versus 2016, detached are up 2%, townhouses are up 12% and condos are up a phenomenal 18% from where they were a year ago. The downturn that they suffered basically has been wiped out and they’re back on the upward path again. 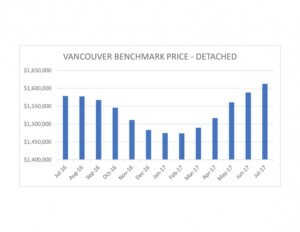 Vancouver monthly benchmark price – detached We can see that the downturn in Vancouver lasted about eight months. If you look at this chart, it will show you that basically, it started to go down in July of 2016 and then it finally basically bottomed out at the end of January of 17 and then it’s picked up since then. You can see that detached houses have come back, roaring back, quite considerably. Condos, interestingly enough, went down only slightly. They just dipped slightly. Their average benchmark prices are a little bit higher than we have here in the GTA but you can see they went from just over the $500,000 mark, up to today they’re now over $600,000 for the average benchmark price. A benchmark price is basically just a formula the Vancouver board uses, Toronto does the same thing, where they factor in things such as the home’s age, the lot size, how many rooms it has and they’re trying to find sort of an average property to compare year over year. That’s their benchmark pricing, and Toronto has the same thing. Where are we headed from here? A lot of people call me, a lot of agents, it’s definitely the most popular topic around the water cooler these days. I believe that the fundamentals are still there, they’re still in place for a strong real estate market going forward in Canada, whether you’re in Toronto or Vancouver. The two cities have a lot of similarities. Toronto’s a little bigger but we both have the same demographics in terms of immigration. They’re the two cities where most of the immigration tends to gravitate towards. Montreal also has immigration but it’s a little bit different than we are. I think we have more in common with Vancouver than we have with Montreal. It’s worth it I think to compare the two cities. Like I said, the fundamentals are still in place. We still have a decent economy, we still have immigration pouring in, not just international immigration but also domestic immigration, where you have people from other provinces moving to the Toronto area by large numbers, and that creates a lot of pressure on the housing stock. Interest rates we believe may creep up just slightly, but they’re not going to go much higher than they are now. As long as the economy remains good, the fundamentals are still in place for a strong real estate market. Will it rebound this fall? Initially, I thought it might but looking at the Vancouver numbers, I believe it’s probably going to be early next year before you see this market start to turn around. It could be January or February. If you are a buyer, this is the time to buy. The old story about, for investors, the time to buy is when there’s blood in the streets. Well, I don’t think there’s blood in the streets right now, but it’s certainly a time where there’s no or very few multiple offers or bidding wars anymore. Basically, if you’re a buyer you can make an offer, a little bit under the asking price, and the asking prices have gone down in many cases, and you can get your house or condo, whatever you want to buy. I think we will look back at the time frame that we’re in right now as a time of historic opportunity for buyers. If you’re a seller … So if you’re a buyer, let’s go back to buyers for a minute, if you have an agent, by all means, contact your agent. Get out there and buy something. If you don’t have an agent, call me. I will be happy to help you. If you’re a seller, it’s probably not the best time to be selling right now. But again, circumstances vary among lots of different people. A lot of people have bought houses many years ago for what today seems like a trifle and made a lot of money on your investment. If your circumstances … if you’re retiring or you’re moving out of town or you’re moving to a different province, you’re going to sell whether it’s the perfect time to sell or not.